Your time is precious so I’ll get right to it. 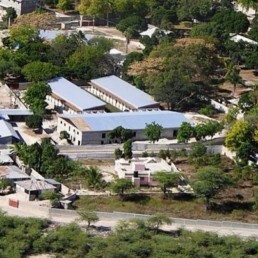 I have just learned of a significant, but brief opportunity to help put the fundraising over the top for the new hospital on the island of La Gonave. Lemon Aid, the Scottish charity behind the build, just informed us of a $90,000 matching grant which will match every gift, dollar-for-dollar. The old hospital, the one that I started working in twenty years ago, is condemnable. Open wiring. Crumbling, leaky ceilings. It is sad. I have personally seen, on my hands and knees, the earthquake crack at the base of its walls, literally separating the structure from its foundation. Truth told, the current hospital is not safe. But for now, it’s all we’ve got. Just across the road from this difficult situation, a remarkable scene has been playing out… the rising up of a new and better hospital, one that will carry forward its 50-plus year legacy of being a place where the love of Christ is fleshed out in compassionate medical caregiving. With significant funds (though not 100%) in hand, construction began in early 2012, on faith that the money would continue to come in. And much has. So here’s where we are. Tremendous progress has been made. Today, with the end in sight, construction had to be suspended until the final funds to be raised (just under $200,000) are received. The September 2013 target date for completion will have to be moved back if we can’t quickly generate the funds and finish this off. But here’s the deal, folks. Amazingly, the $90,000 matching grant—which if taken full advantage of—will put the project over the top! And I’m asking… would you help me seize this opportunity to help La Gonave get their hospital? While the new hospital build is not a Starfysh project (most of our work is currently in the more rural regions of the island), we are convinced that the hospital will provide tremendous lift to the entire island. We see it as a critical infrastructural step in our collective vision to see La Gonave rise up out of her desperate poverty. Every gift will be matched dollar-for-dollar, up to $90,000. If it comes in quickly, construction can continue at a pace to have a grand opening dedication ceremony in late September. If you are prompted to give, you can do so securely on our website or by check. Simply write “New Hospital” in the comments section (online) or in the memo line of your check. Thanks all! May God bless you richly. 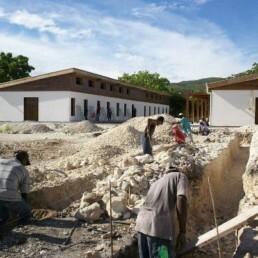 Photography notes: A 100% Haitian labor force is building the new hospital. Image above right shows an aerial view of the new hospital construction site. The two parallel buildings are the patient wards. The rest of the hospital activities (surgeries, deliveries, ER, etc.) will be housed in the larger structure. The buildings and roofs are strategically situated so that the solar panels will be perfectly positioned to receive an optimal amount of sunshine.